For foreign and domestic cars and light trucks. Tighten nuts to factory specifications each time the wheels are replaced. 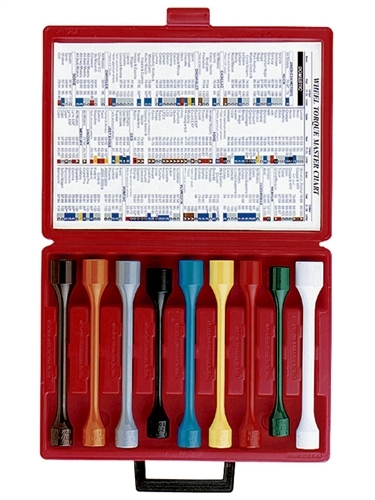 Color and letter coded for quick size and torque reference. Converts any impact gun, including those with an extended anvil, into an instant torque wrench by bleeding torque off the impact gun. Application chart can be wall mounted. Application Charts No. 30199 and No. 30299 are also available separately. Limited lifetime warranty. 30181 – Brown (A) 100 ft/lbs. 30182 – Orange (B) 80 ft/lbs. 30183 – Gray (C) 100 ft/lbs. 30184 – Black (D) 60 ft/lbs. 30185 – Blue (E) 80 ft/lbs. 30186 – Yellow (F) 65 ft/lbs. 30187 – Red (G) 80 ft/lbs. 30188 – Dark Green (H) 45 ft/lbs. 30189 – White (I) 120 ft/lbs. 7/8" Wheel Torque Socket, 140 Ft/Lbs.